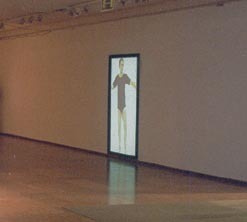 2001, video installation, silent, 2'40"
Framed video screen bigger than life-size. A dancer fills the surface perfectly; the contours of his body touch each side of the rectangular frame in every moment. According to his position his body is stretched or even distorted into the picture. The dimension mixture of reality and virtuality offers astonishing new perspectives. (...) The projected surface is filled with the bigger than lifesize figure of a dancing man. The dancer is the artist himself, EIKE, who has been living and working in Budapest for ten years. His moving body is permanently touching all sides of the dark frame. The dance is rather slow at the beginning, but the choreography gradually accelerates. The body, depending on its position, stretches vertically or grows wider, sometimes even getting stuck within the frame. Our experience concerning the 3 dimensions of the everyday life does not help, we witness a new dimension, yet unkown to our senses. Is it possible that the virtual space is regulated by different spatial rules? The real spatial presence of the frame is being confronted with the space created only in and by our mind. The importance of the frame is stressed, as the spectacle never exceeds it, and keeps being continuously in touch with it from the inner side. As if the picture did not exist without the frame. Indeed, frames determine the pictures for us, although we rarely notice them, concentrating only on the content. Frame, like a window opening to nature and world, is an ancient topos of art, which has never lost its validity through years of time. Even the new media, television, video and computer have not denied this traditional form. The new, strange dimension, in which EIKE is dancing, opens a window on a yet unknown, maybe only virtually existing world. In a previous work (Dancing Place) EIKE has already dealt with the problem of the frame; in that case the moving frame adapted itself to the position of the dancer. Now the frame is fixed, as if it wanted to regulate the movement of the body, however, the body, pursued by the desire to express itself, looks for alternative spaces. Dance is not only the most natural way of human expression, but the means of experiencing the space at the same time. The wooden frame mounted on the wall is powerless against this unknown dimension, and the artist can continue his released, extatic dance.